Jeannette Faber was our guest on Episode 10. C259: Jeannette, welcome to the cloud! Jeannette: Hi, thank you for having me. C259: First off, before we get to your amazing career and looking ahead to Moscow, were you watching closely the US Championships which concluded yesterday? Jeannette: I was, yes, especially the 10ks but I enjoy all the events. It’s interesting to see who is going. C259: Any individual performances that you were noting in particular? Jeannette: I was impressed with Shalane Flanagan and the way she kept the 10K very honest. It’s good to see that even on a hot day she went out and ran hard. It might not have been her hardest performance ever, but she still ran a great time pulled people along to better races. Unfortunately, I didn’t get to see a lot of the events on Saturday and Sunday, I just followed along on Twitter and watched the results show up online, but I’m looking forward to seeing more later on this summer at Moscow. C259: Yeah, you were probably busy with everything else you’ve got going on, which we’ll get to, but first off, the obvious question: You’ve taken 56 minutes off your marathon time in 13 consecutive PRs. Describe the evolution that’s taken place over that time from first time marathoner to World Championship athlete. Jeannette: It’s been a long process, very gradual. The first marathon I’m almost a little bit embarrassed about. I didn’t take it very seriously. I was straight out of college and it was just a natural progression because I’ve always been a strength runner, not a speed runner. I thought well, I’ll just do a marathon. I didn’t train very hard for it, and I went out to Chicago and made the classic mistake of going out too fast and I think by mile 17 I was walking a bit and in a lot of pain. I shuffled my way in to just under 3:30. I definitely knew I could run a lot faster if I had trained and run a smarter race. I kind of regrouped and spent a bit of downtime before deciding to do another marathon. A year later I ran Detroit, which was a great experience in comparison. I think it was 17 minutes faster, so after that it was just sticking with it, getting a little more serious about the training each time. Eventually I set the goal of qualifying for the Olympic Trials in 2012. C259: When did you set that goal Jeannette? Jeannette: I actually was in Boston for the 2008 Olympic Trials. I ran the Boston Marathon the very next day. I watched the women run the 2008 trials and I just remember thinking this is so cool, I want to be in that environment. The next day I broke three hours for the first time, I ran 2:54 and that was when I said okay, I can do this, I just have the shave another 10 minutes off. C259: That was after you had won a marathon in Jamaica, right? C259: What was it like winning a race? Winning a marathon is beyond something Gregg and I can imagine, but when you for the first time won a marathon, what was that like? Jeannette: It was just a lot of fun. I figured I had a shot because the marathon in Jamaica is quite small and very laid back, obviously, it’s Jamaica. It was so much fun, the people there are so warm and welcoming. It was definitely crazy to break the tape and accept an award, that kind of thing. I guess it’s addicting, actually, to do that. C259: But it was running a 2:54 at Boston that really got you thinking you might have a shot at a career in this? Jeannette: Well, I definitely didn’t think I had a career in it at that point. It was more watching the women in the ’08 Trials the day before and kind of wanting to be with them. I was a three hour marathoner when I watched them run so it was still a ways off, but I was improving, and at that point I really sank my teeth in and said okay let’s make this a goal and let’s train harder. C259: That was the year Deena Kastor ran away at the trials, right? Now you are teammates with Deena Kastor heading to Moscow, what does that feel like? Jeannette: I didn’t even think about that. It’s amazing to know that Deena Kastor is my teammate. I haven’t actually met her before, so I’m looking forward to that. We have e-mailed a couple of times in the past week, as we all – Deana, Dot McMahan, and I – are getting our plans together. I don’t know, It’s just crazy. I’m looking forward to meeting her. I’m looking forward to learning from both her and Dot and they’ve already been teaching me a thing or two as we’ve filled out paperwork this week and solidified travel dates. C259: We’re getting a little ahead of ourselves because we want to get through this amazing progression. So after Boston you won another one in Washington, a 2:48, was that one that made you eligible for the trials, or that actually came later, right? Jeannette: Yeah, actually I ran a 2:48 in D.C. and a 2:46 and change at Hartford, which still didn’t qualify me because you had to go under 2:46. So the first time I qualified was in Grandma’s Marathon in 2010 when I ran a 2:42. C259: With room to spare, right? Was it 2:46, so you blew it away there. Jeannette: Yup, yup with room to spare. It’s funny because my friends who were in Duluth watching me, they had gotten confused and they thought my time was too slow. When I found them after the finish line they were like, oh I’m so sorry. I’m like, I just qualified by three minutes, we’re celebrating. C259: Were you disappointed in Hartford the first time even though you won, and even though you set a PR obviously, you always do, you missed by so close, half a minute? Jeannette: You know what’s funny, the first time I ran Hartford and I ran 2:46 and change, the qualifying window hadn’t opened up yet, so they had one date in 2009 which was the US Championships at Twin Cities where you could qualify, and then the window closed again until January 1, 2010, so I knew going into Hartford that I wasn’t going to qualify there no matter what I ran. C259: So then you qualified at Grandmas and then you came back and settled a score in Hartford again, with a 2:41. Jeannette: Yeah, yep that was a good race and I was kind of all by myself in that one. I wanted really badly to break 2:40 in that race and was about 60 seconds short. I went on the next month to run New York and finally break 2:40. C259: Not the easiest place to keep a PR streak alive, New York. Jeannette: Yeah, everybody told me I was crazy to run a marathon four weeks after the previous marathon, and everybody basically said I wasn’t going to run faster, but that’s okay. The PR streak has been amazing and unexpected, but it’s never really been the focus. I wanted to run New York because I wanted to be in the US Championship and competing against those other women and it was It was a really great experience. C259: If the PR streak is not the focus, is there always a specific time you have in mind, or do you set a range of times, or do you let whatever is possible on that day happen? Jeannette: I just try to get the best out of myself on the day. I don’t set hard and fast time goals, which is kind of what a lot coaches want you to do, but that just doesn’t motivate me at all. Being in the race and being competitive and pushing myself is what motivates me the most. I’m happy to progress, obviously, and I certainly want to continue to get faster, but actually, in Boston for 2012, when all of a sudden they had predictions for really really hot weather, I actually said to my friends I wish I was in that race, because I enjoy racing in tough conditions and hot weather and seeing who can outlast the others. I wasn’t registered for that race. It was too late to jump into it, and I was in the middle of a track season, so I couldn’t do it, but I wasn’t concerned about the PR streak, I just wanted to compete. C259: Don’t wish you were in that one. You could have taken our spots. Brenn and I both DNF’d in that race. Jeannette: Oh you did DNF, ooh. C259: It was horrible. Never again. Jamaica must have been pretty warm. Which marathon that you’ve run has presented the toughest conditions? Jeannette: Well, as far as weather, Jamaica was probably the toughest. We started at 5:00 am, and it was at least 80 degrees and quite humid at that point. The nice thing was that I only ran in the sun for 45 minutes or an hour, because the sun hadn’t come up – I must have been at 18 or 20 miles when the sun came up. That probably was the toughest in terms of conditions. On the start line for Twin Cities last October it was only 28 degrees, and I was cold for pretty much the whole race. C259: Weather aside, which was the toughest for you, physically, mentally, or just getting through the race. Jeannette: I can say without a doubt Olympic Trials were the toughest physically and mentally. I dealt with really bad plantar fasciitis right before the trials and I actually had to stop running for two weeks the month before. I cross-trained quite a bit and quite hard. Once I started running again, I had a lot of soreness not only in my feet but also in my quads. I just knew going into the Olympic Trials that I wasn’t where I wanted to be, I couldn’t race the race I wanted to have, and I was going to be very lucky to squeak out a PR, which is exactly what I did. C259: In an Olympic Trials race, is it hard to keep your focus when you know you’re not going to make the Olympic team? Jeannette: Well, it wasn’t for me because you’ve got to remember where I was four years prior to that. I was just happy to be in that race in 2012. Honestly because I had to stop running in the month of December, I was happy to be toeing the line and confident that I could actually finish the race. You know, the only thing that kind of stinks about running in the trials is assuming that I wouldn’t going to make any money. It was going to take a miracle for me to run in the top 10 that day. When you can make a bit of money running the marathon, it certainly helps, so I was going to run it just for the experience, of course, I wouldn’t turned it down for anything, but it is a little tough to know that you’re probably not going to make any money. C259: It’s a sacrifice. Every marathon takes a chunk out of you, for a little while anyways. C259: This is a big issue for the World Championships, right? For a lot of runners they are giving up one or two of their big paydays a year. Is it a financial hit for you, or is there a chance you could make some money for Worlds? Jeannette: You know I actually looked at the prize money structure for the marathon today. Initially I thought it only went three deep but I believe it goes eight or 10 deep. It would take an amazing, amazing race for me to finish in the top 8. I’m going in with the expectation that I’m going to race for the experience and try to make the most of the opportunity but not necessarily get a paycheck. It’s a little tough, for a split second I considered the money side of it, and thought, you know, maybe I should just gear up for Twin Cities again, which is the U.S. Championships this year and offers a nice prize money, but then I thought to myself that’s ridiculous, I may never get this opportunity again I’m certainly taking it. C259: I would hope that the exposure of running for your country would help you in other ways financially down the line. Jeannette: I suppose it’s possible. I’ve been surprised at how a race might now impact you right away but you are offered opportunities down the line, that’s definitely true. C259: We’ll come back to the issue of opportunities and funding in the sport, but once you get past Moscow, any inkling of what your next goal is? You’re probably not looking past it, you probably do take it one race at a time, but longer term are you thinking about making the Olympic team? Jeannette: Oh, that long term. The 2016 Olympic qualifying process is certainly on my radar. I guess I can’t look that far ahead yet because I honestly think it’s going to take something similar to what Shalane, Kara, and Dez ran, a 2:25 to 2:27 effort. For me, I’ve always set realistic goals. Right now I’m at 2:32 with my PR, and it would take quite a bit for me to get to 2:27. So for me I can’t really look to the Olympic Trials yet. I have to break 2:30 first and then inch my way down. I’m certainly thinking about it, but thinking more about the races in between now and then and how I can put myself in that position. C259: Is Moscow a 2:30 course, by any chance? Or is it something you’ll save for your next marathon after that? Jeannette: I’ve looked at the course map and it’s a little bit confusing, I need to do more research. It looks like it’s pretty flat. It is a loop course, we do three loops of roughly eight miles, very similar to Houston, I believe. I looked a bit at the weather, and we run at two in the afternoon, which is unusual for a marathon – probably not for the World Championships but for most of the marathons I’ve run. It’s going to be a little bit warmer, it can be humid. I don’t think it’s going to be the best opportunity to run sub 2:30, but at the same time the competition might pull me along, hopefully. We’ll see. I’m not too confident that sub 2:30 can happen then, but I don’t think it’s a terribly slow course, by any means. C259: Just an update on your training, the plantar fasciitis has died down, but you had some hamstring issues not too long ago? Jeannette: Yeah, I had a hamstring strain in the spring. Unfortunately I strained it a couple of times, and it was tough to get through. I’ve never had a muscle issue before, and it took time for me to learn how to come back from that and how it wasn’t going to feel normal for awhile. I definitely took the conservative approach knowing the opportunity to run in Moscow was on the radar and I didn’t want to continue to strain it and not be in a position to accept the spot when it was offered. It’s doing much, much better now, I don’t even notice it any more. I’m happy with how that’s feeling. C259: That’s great to hear. Back to the business of the sport, tell us how your life has changed or how it hasn’t, now that you are an elite runner. Jeannette: For the most part I’ll say it hasn’t. I’ve done a good job of flying under the radar for awhile. I’m definitely in a position where I still need to work. I am working 30 hours a week now. If everything comes together, my plan is to accept a full-time position at my current job after Moscow. C259: What is the current job? Jeannette: I work at Nashville State Community College here in Tennessee, and I just do administrative work. Hopefully I’ll be stepping into a bigger role later this summer. C259: Is there a track there that you can train on? Jeannette: There is where I live in Nashville. The community college doesn’t have one. Nashville has been surprisingly a nice place to train. I live right on a running path, which is absolutely beautiful. The community here has been better than I expected. I moved to Nashville honestly with the intention of training alone. Very quickly I was welcomed into this group which shares workouts. It’s not exactly a team, it’s just a random group of runners in the area who reach out to each other and try to connect for long runs, workouts, whatever – pool parties. So that’s been really nice. There are a number of guys in the area who have reached out to me and said I’ll help out with my marathon training, I’ll do your workouts, that’s always appreciated. Actually, Lanni Marchant, who is one of the Canadian runners who will be competing in the World Championship marathon, and she splits her time between Chattanooga and Nashville. We have met a couple of times for long runs and eventually hopefully we’ll get together for a workout. C259: That’s great. It always helps to have good people to run with. Jeannette: Definitely, yeah. On the whole I’d say elite running hasn’t changed my life too much. I certainly enjoy it and I don’t take any of it for granted, but there was a period of time where I was not working and I was training full time, that was basically before the Olympic Trials, but it didn’t last for too long. I spent down quite a bit of my savings. I’ve found a good balance between my working and training. I have confidence that I can train at a high level while working full time. I really think the best way to do that is to find an employer who understand what you are doing and who supports it, and I believe I’ve found that with the community college that I’m working at. C259: How much mileage are you doing, and when are you getting most of your runs in, before, during, or after work? Jeannette: I’m only doing about 90 miles a week right now. C259: Only 90! Gregg, we need to get to that point of only doing 90 a week. Jeannette: For a marathoner I feel that like that’s low. C259: I know, we’re just teasing you because we are definitely mortals in this game. So when do you squeeze your 90 in during your 30 hour work week? Jeannette: Most of it is in the morning. Right now I’m actually not going into work until late morning or early afternoon, which makes it very easy to get solid workouts, solid mileage in in the morning and even sometimes hit the gym or do some strength work at home as well. And then occasionally I’ll also run after work. It can be nice because the humidity is often lower in the evenings, and then of course big long runs on the weekends help bump up the mileage. C259: What percentage of your co-workers know that you are headed for the world championships and how great a runner you are? Jeannette: My co-workers are so funny, they are the sweetest people. A fair amount of them know that I am headed for the World Championships, but none of them are really runners, so I got the classic question the other day: How many miles is this marathon? But they do get it an my boss Julie, she really gets it. We’ve looked ahead to the future and considered how I can make it work while working full-time. I had to explain to her that being gone for two weeks for the World Championships is unusual. Only this and the Olympics are going to be time commitments of that amount. Basically, all of the other races are a long-weekend. But she’s been great and I really think that they’ll be supportive going forward. C259: What you’ve said about the funding and how it hasn’t changed your life isn’t a big surprise to us. We’ve mentioned that money in the sport only goes to a select few. Do you have a sense of how close you might be to being self-funding? If you were a 2:29 marathoner, or 2:28, or something like that, would you be able to devote full attention to it? Jeannette: You know it’s so tough because I feel like, well, last year I had a pretty good year, winning Twin-Cities was a big surprise, and depending how cheaply you can live – and I can live pretty cheap – I was almost able to live off of that money. This year, just getting injured, I haven’t raced in so long. Prize money has been everything I’ve made in this sport, and it’s such a gamble to try to be self-supporting without that contract from a shoe sponsor, so I’ve kind of had a wake-up call this year, and I really feel more comfortable – and my coach has talked to me about this in the past about this too and he has a good sense of things – when you are working, you have less pressure to compete well and to make that money, which can be beneficial to your training and to your competing. So, of course I can’t say that I would turn down a sponsorship from a shoe company, but I’m trying to keep a healthy balance of not expecting that in the future. After Twin Cities I reached out to a few people, and one gentleman, he’s an agent, he flat-out said to me you’re not going to get anything until you run sub-2:30. That was a bit of a shock, but also I also appreciated him saying that to me, you know, this is how it is. I guess that’s part of the reason I have 2:30 on my radar, but I just don’t plan on anything like that happening. C259: So you do represent Brooks, but that is mainly to give you equipment and shoes? Jeannette: Yeah, I’m part of the Brooks ID Elite team. Are you familiar with their ID team? C259: I’ve heard the name I just don’t know the details. Jeannette: There are different stages of it, I believe, but Brooks reaches out to a lot of people in the running community and invites them on to their ID team. You are a face in the running community and you do receive gear. I think the elites on the team receive a little bit more gear. I’m very grateful to have that because they’ve offered everything I could need for a year worth of running. I joined with them on January 1. It was a tough decision to leave the Boston Athletic Association because the BAA was a really great team to run on, and they even kept me on the team although I was living in Portland, Oregon, for a year. So right now I’m just on gear with Brooks. C259: Right, I had heard of the team. There’s a Flotrack video that I recommend people watch with Matthew Eliot, who finished fourth at USAs. He’s one of your virtual teammates on the Brooks ID team. It’s a very short interview but I was amazed at how overcome with emotion he was to finish 4th at the 1500. It’s pretty incredible stuff. Jeannette: I did watch that and I almost started crying myself. Lately I’ve been a big softie. Yeah, I watched him run at the Music City Distance Carnival which is a track meet here in Nashville, I guess it was three weeks ago, maybe four weeks ago. He won the mile there, so I met him just very briefly. It was phenomenal. Watching his little video I felt the same way. You are working so hard in your daily life just to keep up with life, and then training on top of that, and so when the training goes well and pays off it’s just overwhelming. C259: We’ll put a link to that video in our show notes. Matthew is a full-time teacher, I think an elementary school teacher, like you he has a full time job. Now we understand a bit more about the Brooks ID team, thanks for that background. What about PowerBar, how are they supporting you? Jeannette: PowerBar supports with products, which is probably more products than I can use. Jeannette: I’ve got a lot of PowerBars in my house, if you are hungry. They also have something for athletes, I believe they have some kind of compensation program. I have not looked into it too closely yet because unfortunately I haven’t been racing yet. It’s definitely something I’ll look at soon. My buddy Jerry got me in touch with them, and it definitely helps having them on board. C259: One of the interviews I watched after the races was Jenny Simpson talking about Mary Cain. Someone asked her what it would be like to be her teammate. She talked about how one of the few times you have a team is running at the World competition, so of course she’ll embrace Cain as a teammate. That perked my ears up because we’ve noted before how New Balance has a strong middle distance team, with Simpson and Brenda Martinez. From the outside looking in, we’re curious how these relationships work among members of the same sponsor. Is that a “team,” so to speak? With Brooks, do you ever talk with Amy Hastings or Ryan Vail? How exactly does it work? There’s a lot under the Brooks umbrella. Jeannette: Yeah, I’m just starting to realize how big Brooks is. To be honest I don’t know Amy Hastings. I got into the Brooks family, I guess you could say, by way of Katie Mackey and her husband Danny Mackey. When I was in Portland they were in Portland as well, and I ran with them a bit. Danny is coaching the Brooks Beast team out in Seattle. He’s the one who put me in touch with the Brooks folks, kind of got things going for me. I actually did consider joining Hansons this past winter. I visited them, of course I grew up in Michigan so I’m a huge Hansons fan. I really like Keith and Kevin, I really like their program. I was basically on the verge of joining, and when I really weighed things out and looked at what was best for me, I was considering so many different factors, it ended up I wasn’t ready to pull the trigger on that. The biggest factor honestly was just that I wanted to stick with my coach who I’ve been with for almost five years now. C259: What’s the name of your coach? Jeannette: His name is Terry Shea, out of Boston. C259: Is he with the BAA? C259: So you still have a coaching relationship even though you can’t wear the BAA uniform? Jeannette: Yep, I never thought about it like that, but yes, when I decided to leave the BAA I made sure he still wanted to coach me before I went anywhere. C259: Is there anything about the Hansons method? Is that something that wasn’t to your suiting or did that have nothing to do with it? Jeannette: It didn’t have much to do with it, and what’s funny is that my coach Terry used to run for Hansons, he and his wife both did, so his coaching method is very similar to the Hansons because he was under that umbrella for awhile, so it didn’t have anything to do with that. It was more details of housing, health insurance. I am a little bit older so I wasn’t willing to join group housing. I also wasn’t ready to give up my shower, so it was smaller factors like that that didn’t quite add up right for me. I’m still a huge Hansons fan. I’m friends with Dot, which has been really nice throughout this whole World’s process so far. Part of me still wants to be on that team, but I’m very happy with what I decided to do in moving to Tenneessee. C259: So your next race is a prep for Worlds, a half marathon in Costa Rica in July. Did you get an appearance fee or is there a prize that you are looking to get there? Have you ever gotten an appearance fee is another question. Jeannette: I have gotten an appearance fee, yes, with one of the New York City road races. They [New York Road Runners Club] do a pretty good job of taking care of athletes, even the smaller athletes like me. This race in Costa Rica there is no appearance fee; there is a prize purse which I’ll be thinking about. C259: Incentive to run hard, eh? Jeannette: Yeah, it’s motivation, I’m not going to lie. This was weird how this one came about. The gentleman who coordinates the elites, his name is Federico. He contacted me through Facebook, which is always a little weird getting contacted through Facebook. We talked, we actually Skyped at one point. The thought of racing in Costa Rica sounded wonderful. I had never been there, but it’s a place that my dad likes quite a bit and he always talked fondly of. I jumped at the opportunity, and I’m really excited to go down there and do it. Not sure what to expect, but I’m excited. C259: Do you consider that optimal, I think it’s four weeks before Worlds, to run a half marathon? Maybe it’s five weeks, I’m not sure. Jeannette: Four or five. Yeah, I definitely need a tune-up. It’s been awhile since I’ve raced so that’s scary for me. I’m looking forward to just getting back in that environment and making it hurt. Just going through the process, honestly. Another reason I was attracted to Costa Rica was the travel and because it’s going to upset my schedule. Moscow is going to be a whole other level of upsetting what I am used to, so I figure this was a nice way to introduce that. I actually know one of the other women who is planning on racing it, Heidi Westover. We raced quite a bit when we were in New England, and the funny thing is she’s actually running for the Brooks ID elite team now as well. You kind of bump into people here and there. C259: By the way, are you paying your own travel expenses to get to Moscow? Jeannette: No, USATF will, or I actually think the IAAF pays for that, but don’t quote me on that. C259: They have the ability to pick five for the marathon, but they are only going with three on both the women’s and men’s side. It could be a cost factor, we’re not sure. C259: We had Patrick Rizzo on awhile back. We thought why can’t they bring five, because it might be able to get him in there. We talked a little bit off air before the show started on how you got picked to go. Part of it is that once Kara and Shalane decided that they weren’t going to do it, it opened up some more slots. Describe the day that you found out that you were going. Jeannette: Well, I was in Chicago, visiting a friend. I randomly checked my e-mail, and there was an e-mail from USATF that I guess kind of knew may be coming, but I just couldn’t believe I was going to get the opportunity until I saw it in print. A little bit of a wave of emotions right from the start, you know. I had seen it coming for months now, but just to have the offer of the spot hit me hard and I burst into tears, and then celebrated with my best friend that evening. Of course right when I got that e-mail I forwarded it to my coach. He works a full-time job so I knew he wouldn’t be able to respond right away, but he responded later in the day and his response was just, wow, there it is, it was just setting in for him too. I feel like me making the team was the result of a number of things happening, some of it not necessarily good. I ran 2:32 back in October, and If you look at the women who were on the performance list between October and May, there was a number of us very close to each other. Kara and Shalane were one and two, and then Renee Metivier Baille was number three, and they were all sub 2:30, and then it was Dot at 2:32 low, and me at 2:32:37, Deena at 2:32:39, and I think maybe Stephanie Pezzullo was the next one, and she was within five seconds as well, and Stephanie Rothstein was within five seconds. Why I mention this is because I ran my time in October, and I’ve just been watching the results come in over the months since then, and I’ve been a bit in shock. When I saw that Deena Kastor’s time from the LA Marathon was two seconds slower than my qualifying time, I laughed out loud because I couldn’t believe it, not like a mean laugh but just holy cow, I’m still in the running to make this team. The other factor was NYC was cancelled and I assume a number of American women would have run pretty well in New York City. I feel like I’m very happy to make this team and I’m honored, but I think it was the Perfect Storm is the reason why I’m making this team. C259: Well 13 straight improvements puts you on the right trajectory. Jeannette: It’s true. It’s still kind of unreal to me, to be honest. C259: One last question on the business side of the sport before we talk a bit about training and ask you to help us with our training. Generally, are there ways you think the funding model could or should be changed to help people who are devoting a lot of their lives and hearts and souls to running, and may be getting support through equipment but not much else. Jeannette: You know, it’s hard to say from the shoe companies’ side, especially since I’ve never been on the inside with the shoe companies. It seems to me that with programs like Brooks ID and the Saucony Hurricane, the shoe companies are seeing more value in reaching out to the community and spreading themselves a little bit thin rather than putting their money into a few big stars. I suppose in a way that actually helps American distance running because I am part of the Brooks ID Elite team and I get their guidance and their help, but I feel like especially after the Olympic year, everything kind of shut down and a lot of athletes lost their sponsorship, and that’s hard to see. It’s hard for me to comment on that part of it, especially if Brooks and Saucony are seeing more value in not sponsoring as many people but giving gear to more people. The other side of it – basically I’m going to tell you that I have no way to really fix it – but the other thing that I sometimes see and that I wish was a little bit different, was even on the U.S. circuit, as far as road racing – the marathon championships, the half marathon championships, all those races that we have throughout the year through USATF, it’s a little bit discouraging to see that spots 8, 9, and 10 are getting $500, $400, $300, when the winners are getting $12,000. You know, I wish that they would spread it out a little bit more evenly. I understand that the winners should get big paydays, but it just hurts when the winners already have decent shoe contracts, and spots 8, 9, and 10 are working full-time jobs. That’s the only place I feel like I would ask for some change, but that’s also because I’ve been in 8, 9, and 10 for a few years. That’s how it goes. C259: Right, well, our hats off to you. Not an easy way to make a living. We’ve got jobs too, and I’m doing everything I can to get in 50 miles a week, so to get in 90 miles a week, well. I think Pat Rizzo told us there is nothing like doing something you love, to get paid to do something you love doing. Jeannette: True, yeah, anytime I’m invited to a race like this event in Costa Rica, and they’re willing to pay my travel, it kind of hits home. I can’t complain about anything. I can’t complain about not having a big contract, you know. I’m so lucky. I hope other people will talk about how to fix it, but I can’t say too much on that. C259: Let’s shift to training a bit. We’re really interested in how your training has evolved over your 13 PRs. Did you layer in better nutrition at some point, or weight training at some point? Just looking at your training broadly, have there been major steps that you’ve layered in during certain points in time, or is it just more volume? Jeannette: Well, as far as going from 3:28 to 2:32, I definitely increased volume. When I ran 3:28 and 3:11, I was probably running less than 50 miles a week. And then the intensity. I wasn’t doing track workouts consistently until I started getting into the lower 3s. And then basically when I made that decision to qualify for the Olympic trials, it was unrelated but I moved to Boston shortly after that, and joining the BAA was probably the best thing that could have happened to me because they had six women in the ’08 trials and it was just an incredible environment to learn how to train. Being coached by Terry has been wonderful for me. I feel like he understands me so well, and also gives me enough room to make my own decisions within my training and in competition. Yeah, it’s been a slow gradual build of miles over the years. I’ve also been lucky because for the most part I’ve been healthy. Unfortunately this year I had my first real setback with not being able to log consistent miles. We’ll see how that plays out, but I’m still what I consider a low-mileage marathoner. I think 109 was my highest week ever, and that was once, before Twin Cities, one week. Most of the time it hovers around 90. C259: Running once a day or twice a day? Jeannette: I would say I run doubles two to three times a week, but most of it I do in singles. Honestly a lot of that is sheer convenience. It’s hard to get the doubles in. When you’re working it’s easier to get in once a day. Showering twice a day seems such a waste of time. C259: You’d say primarily the number one thing is volume, more miles. 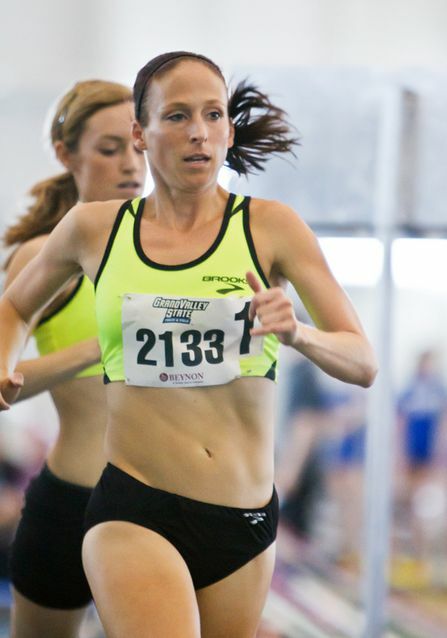 Jeannette: Well, the other thing I wanted to say is that as I’ve dipped under three hours and gotten more serious, I’ve also realized along the way that improving my speed and improving my 5k and 10k times has really helped. That’s what I was working on this winter when I strained my hamstring is that 5k speed, but I really believe that is still beneficial for the marathon training. C259: Yeah Alan Culpepper on the show last week, his training advice was to get fast first. He was suggesting that we get our 5k, 10k times as low as we can before starting the big marathon buildup. That worked for him really well. Jeannette: That sounds about right, I believe that. C259: Do you think there is any conventional training wisdom that is wrong? Jeannette: No, this sounds terrible, but I’m not too well versed on training methods. I don’t read the books like a lot of people do. One thing that I know works for me that I think a lot of people make a mistake with is on my easy days, I am running slow. This is also part of the reason I am very comfortable training on my own, because I don’t want to be pulled into anybody else’s pace when I’m trying to recover from a workout or a long run. I think a lot of people believe that they have to run sub-7 minute pace all the time, even on their easy runs, and they end up a bit burned out when it comes time to race. C259: What’s a slow run for you, Jeannette? Jeannette: Sometimes I’m around 8:30 pace, occasionally 9:00 depending on how beat up the legs are. My favorite runs to do are when I know how far the course is and it’s just a recovery run. I won’t even take my watch because I don’t care, and I just try to go as slow as what’s comfortable. C259: That also ties in to what Alan was saying, you don’t want to run your recovery runs with a group. It’s good to run with groups generally, but your recovery runs or easy runs sometimes best not with the group. It is tough to ask about is there is a part of conventional training is wrong, because there are a lot of people who offer advice on how to train, and a lot of the advice is contradictory. It’s up the runner to decide which bits of wisdom to use. Jeannette: And runners are so different, what works for one of us doesn’t work for another, so it’s important to pay attention to what works for you and not worry about what other people are doing. C259: If you could think back to right before you broke 3, after you won Jamaica but before your Boston experience. We’re really trying to break three. We’ve run a bunch of marathons, and our PRs are both 3:08. Our selfish portion of the interview: If you could provide one training tip to help us get under three, what would that be? One tip. Jeannette: So I looked at your website and I went through the other tips that people mentioned and most of them seemed to be based on training and workouts that they suggested, and what struck me about that is that none of it was the mental side of running. I’m a big believer in running smart and preparing in a smart manner and racing in a smart manner. My suggestion is to assume that you are going to break three. When I think about a race that is coming up and what my goal is for it, I just go about my business as if there is no chance I’m not going to reach my goal. I don’t even think about it. I don’t even think about not doing what I want to do in a race or having a good race. I always visualize the race going perfectly. It doesn’t always go perfectly but it goes well enough. C259: I like that. It takes some of the drama out of the quest. Going into a think like that, added drama doesn’t help, so I like that. Jeannette: Yeah. I was actually thinking about when you have a time goal (and your goal is to break 3 so I don’t know if I should say this) you have an expectation that you have to hit it, and I feel like that can add stress to your training. In reality, if you just assume that you are going to hit it, you train in this euphoria because you think you are going to do it. That’s how I train, and I imagine scenarios that are even ridiculous, like winning the World Championships marathon, notsomuch because I think I’m going to do it, but because it makes me excited about my training and excited about the race. My suggestion is that for your next race, assume you are going to break 3 hours. C259 (Gregg): I love that tip for many reasons, but one because I never do it, because I don’t think I’m going to break 3, I think Brenn will break 3. Jeannette: Okay, who is running Hartford? C259: Before we get to Hartford, I just will note that Lauren Fleshman also did comment on the mental side. Her advice was fantastic too and it helped one of our listeners get under 3. But thank you, we hadn’t heard that, assume you are going to break 3, that’s fresh. Now, Hartford. C259 (Gregg): Hartford is my next marathon and that’s the one you’ve won twice, so I was hoping you would have special tips for that. Jeannette: Well I took a look at the course map, because it changed in the years that I ran it. Not significantly, but they moved some miles around. You are still running the same course but at different times. I took another look at it to make sure it was the same course I ran last. First of all, Hartford is absolutely gorgeous, and it’s the best time to be in New England, running that course. You go along the river pretty early on, and it’s nice, then you eventually get to the east side and you do this big long out-and-back, and that’s kind of fun because you see the other runners. But then, when you are headed back into the city you are kind of in no-man’s land, maybe from 23-25 or maybe it’s 22-25. That’s where I really really struggled. Obviously you are hurting, because it’s after 20 and you just want to be done. And so I guess I would say prepare to know that you have to stay focused in that one spot. There are less spectators, and you are just like, where am I? And am I ever going to get downtown, to Bushnell Park? I would prepare for a tough stretch, I think it’s from 22-25. C259: Maybe I’ll spend those few miles thinking about how a World Championship athlete gave me a tip to stay focused there. Jeannette: I’ll be checking the results to see if you get under 3 hours. It’s wordfneul to have you on our side, haha!